Why Is Creative Play Important For Your Child? In life, when we’re given the chance to freely express ourselves, this is called creativity. While it comes in many forms, children especially, benefit from these different forms of creativity. When these children are given the opportunity to commit entirely, and be free with themselves, this allows them to take the creative process to a whole new level, allowing for true happiness. The creative process in children is far more in-depth than what the finished product will be. When a child learns the different forms of being creative, it’s often used as self-expression to cope with their feelings. When a child enters in creative play, this helps to foster a child’s critical thinking skills, while broadening their mental health. Watch closely and listen to what your child is telling through their actions. Provide your child with different activities to fulfill each of their needs. 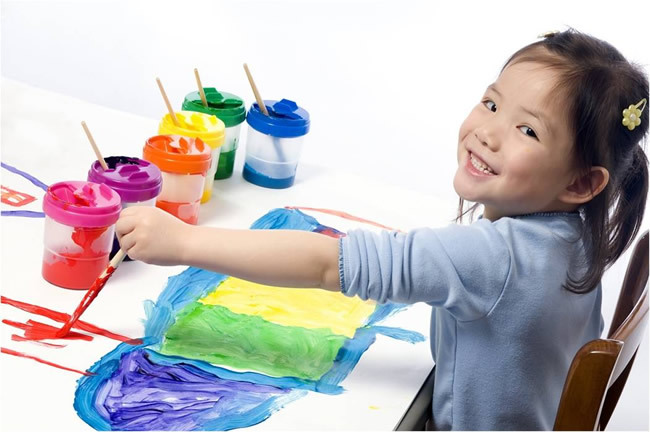 Offer a variety of creative materials along with different experiences: trips to the museum, listening to different types of music, looking at photography, playing musical instruments, painting a canvas, or working with clay and water. Ask your child questions about each of these materials, while listening closely. It’s important to give your child the opportunity to explore many different expressive materials. This will not only encourage your child’s creative process, but this will help them to make simple choices on their own. You should start to notice your child displaying these important components of the creative process, by owning control and independence over certain situations. Show plenty of support by offering appreciation during this creative process. One of the most important activities a child can have is through creative play. When a child uses materials they are familiar with, in unusual or different ways, this helps to broaden their imagination. Engaging your child in spontaneous, self-directed plays throughout the day is another great way to enforce their creative spirit. Many parents underestimate the physical, mental and social development children acquire through creative play. As the child’s parent, avoid all control, if possible. Allow your child to use this time to freely express themselves. A parent can give a child ideas or unique props to help stimulate their child’s mind. Never discourage your child in any way.